The scientific name of the clouded leopard is Neofelis nebulosa, and there are three subspecies. Leopard subfamily of the smallest. The proportion of the largest proportion of existing cats, can kill the larger prey, this feature is extinct prehistoric saber-toothed tiger similar. 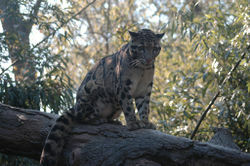 The clouded leopard is one of the larger cats, which is larger than the crenelated cat. Its body size is between leopards and smaller cats. The body length of 70-100 cm, tail length 70-90 cm, tail length and body ratio of 4: 5, shoulder height 60-80 cm, weight slightly larger than the female male, male about 23-30 (maximum 40) kg, Female about 16-22 kg. Clouded leopard has a short and vigorous limbs, almost as long as the body and very thick tail. Head slightly round, prominent nose and mouth, claws very large. Body color golden yellow, and covered with large dark cloud markings, so called "clouded leopard". Clouded leopards are not social or social evidence, so they are likely to be solitary animals. Female clouded leopard in the 85-93 days after pregnancy, each child can give birth to 2-4 young leopard. Like many other cats, the young leopard has no open eyes at birth and no protection at all. Young plaques born at the time of the stain is completely dark, rather than the dark outer ring.Young clouded leopard is about 12 days of birth to open his eyes, in five weeks will become very active, lactation period of about 2 months, about 10 months old began to live alone. Clouded leopard about a year and a half to the development of sexual maturity, female clouded leopard can be pregnant once a year. Captive of the clouded leopard can live to 17 years old, the wild clouded leopard can live about 11 years old.The average life expectancy in wild state 11 years, the average life expectancy under breeding state 13-15 years, life expectancy up to 17 years; the territory of 30-40 square kilometers, the core range of 3-5 square kilometers, large overlap between male and female. Clouded leopards often rest and hunter on trees, but they hunt on the ground longer than trees. Clouded leopard habitats in subtropical and tropical mountains and hilly evergreen forests, most often in evergreen tropical forests, but also in other habitats to see it, such as secondary forests, mangrove swamps, grasslands, shrubs and coastal Broad-leaved forest, the vertical height of up to 1600-3000 meters above sea level, the ambient temperature of about 18-50 degrees Celsius. 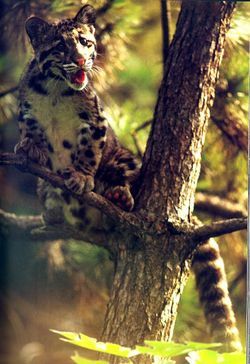 Once the cloud leopard in the Himalayas at an altitude of 3000 meters above sea level activities.. Clouded leopard daytime rest, nocturnal activities, it is very strong climbing trees, like the branches waiting for prey, small animals approaching, they can jump from the tree prey. It can not only hunt monkeys and birds on the tree, but also down to catch mice, rabbits, deer and other small mammals, and sometimes steal chickens, ducks and other poultry, but not to hurt wild boar, cattle, horses, people..
↑ Neofelis nebulosa Wikispecies. Web. Last modified January 4, 2017. Unknown Author. ↑ About the Clouded Leopard The Clouded Leopard Project. Web. Accessed January 30,2017. Unknown Author. ↑ Clouded Leopard A-Z Animals Web. Accessed. January 30, 2017. Unknown Author. ↑ Facts About Clouded Leopards Fact Sheet Clouded Leopard . Web. Accessed January 30, 2017 .Unknown author. ↑ Life Cycle Clouded Leopard. Web. Accessed January 30, 2017. Unknown author. ↑ Clouded Leopard animal spot. Web. Accessed January 30,2017. Unknown Author. ↑ clouded leopard Encyclopedia of clouded leopard. Web. Accessed. January 30,2017. Unknown Author. ↑ Ecological Habit Ecology of clouded leopard. Web. Accessed. January 30,2017. Unknown Author. ↑ clouded leopard China wiki. Web. Accessed. January 30,2017. Unknown Author. This page was last modified on 16 February 2017, at 17:55.